The Power of Chi, Cayenne, & Icon offer an awesome mixture of both UVA & UVB tanning rays. They are all 12 minutes long. Offering High Pressure Facial tanning bulbs, full body fans & facial fans, & the opton of lowering the power of the lamps. The lcon & Cayenne offer a body mist & the Power of Chi offers aroma therapy & a body mist. Platinum Membership * 12 month contract only $49.00 per month. Includes: Icon, Cayenne, Chi, Eclipse, Cyberdome, Cyclone, Premiums, Legacy and Entry Level beds. 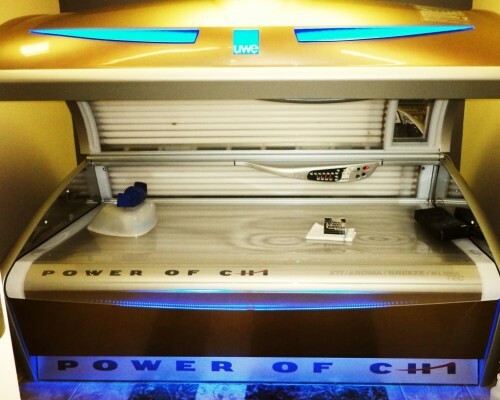 The Power of Chi is an awesome way to relax, tan, and increase circulation at the same time in only 12 minutes!